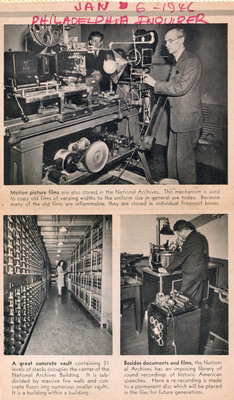 "Philadelphia Enquirer on National Archives Film Preservation, 1946"
Photo story, Philadelphia Inquirer, January 6, 1946 about storing motion picture films in the National archives. The first photograph shows Carl Louis Gregory with his optical printer for copying old films of varying widths to the uniform size in general use today. The second image shows storage vault, and the third sound preservation.